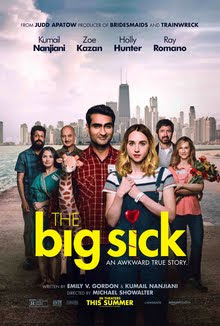 So, the movie opens with Kumail (Kumail Nanjiani), a young Chicago comedian who performs at night and drives for Uber during the day. He was a one man show about his Pakistani background, but no faith in Islam, something that he hides from his very Muslim family. His immigrant parents are both trying to push the idea of an arranged marriage onto him and he politely plays along but has no interest in it whatsoever. At a show one night, he gets heckled by Emily (Zoe Kazan) who is white and not Muslim. He approaches her after the show and their one night stand eventually develops into a relationship. Kumail doesn't tell his family about his relationship because he knows that they will disapprove, but eventually, Emily finds a box with pictures of all the women that his parents are trying to set him up with and when asked, Kumail admits he doesn't see a long term future with her due to his families expectations. Emily then breaks up with him. Kumail then gets a call that Emily has fainted and in the hospital. A doctor then tells him that she has a serious lung infection and must be placed in a coma and intubation. He signs the permission form and ends up calling the parents Beth (Holly Hunter) and Terry (Ray Romano.) They know that Kumail and Emily have broken up and tell him that he's not needed, but he ends up sticking around anyway and the three become close as they try and figure out what's going on with Emily. Kumail's parents visit his apartment, pissed off that he's not getting on board with their marriage plans and Kumail ends up telling them everything and he disowns them. When Emily's condition takes a turn for the worst, he also ends up bombing his audition for the Montreal Comedy Festival, telling the audience talking about his fears and distress at her situation. But then- she wakes up! Turns out it was adult-onset Still's Disease, which is rare, but treatable. Emily, however, still doesn't want him back- either at the Hospital or later, when he asks her to take him back at her homecoming party. He then decides to move to New York City with two comedian friends of his. He tells his family about the plan and refuses to let them disown him. Emily finds a video of Kumail's audition failure and goes to visit him after his one-man show to thank him for all he did for her while she was in a coma. Flash forward a month or two and Kumail gets heckled by someone at a performance in New York. He looks- and it turns out that it's Emily.